Complementary food in granules for horses. For proper intestinal and stomach balance. Stress and its physiological characteristics mean that horses are prone to gastric ulcers. The pain these cause often passes unnoticed. But certain signs can alert us. The most frequent are changing habits: a finicky, irregular appetite, a lack of condition even after proper deworming and diet; a dull, pitted coat and sometimes gnashing teeth and abdominal pain (not colic). This is a 100% natural product which, thanks to its clay content, creates a gastric dressing which will ease the pain. Konjac, a plant with its origins in Asia has been used for centuries for gastric problems in association with psyllium, rich in mucilage, assures balanced digestive transit, synergised by ispaghula (which is also rich in mucilage) to create a protective gel for the gastric wall, permitting in-depth healing of the ulcer. Foals: 20 gr/day/animal for 2 weeks. Can be used preventively, in which case half the dose and administer for 3 weeks (e.g. 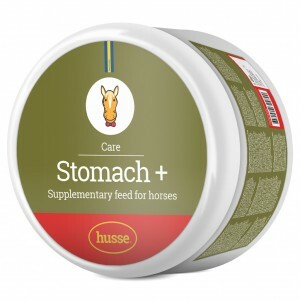 : for an adult horse, 25 gr administered continuously over 21 days). To be administered directly in the feed. Ensure that there is plenty of good quality water for the animal. Can be used during growth, for maintenance, during moulting, gestation, suckling and on very young animals. Biological molasses, ispaghula, clay, konjac, psyllium.